I think I must have forgotten how beautiful Atlanta is during the summer or I would have come back sooner (If it weren't for my truly amazing friends, I would have been). This sunflower (photo) is part of the plant collection of the Edible Garden at the Atlanta Botanical Garden. You can always, and I mean always, count on seeing incredible color at the Garden...and have I mentioned that they offer tours on Tuesdays and Thursdays at 1:30? 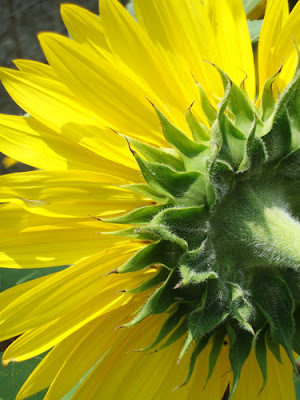 Join one to learn more about the new Edible Garden and see the beautiful sunflowers! Every time I see sunflowers, I'm reminded of three things: (1) My best friend whose favorite flower is the sunflower; (2) the television show "The Victory Garden," which I saw at Callaway Gardens in Pine Mountain, Georgia (their sunflowers were way taller than me); and (3) the movie, one of my all time favorites, "Under the Tuscan Sun." Congratulations on our 20,000th website hit, Travis. This is a great blog and I'm glad to see the world is getting to know it!